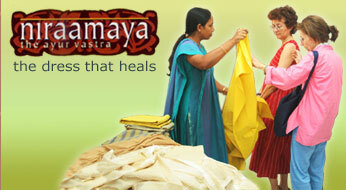 There are two processes for making Ayurvastra. 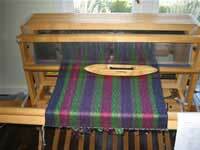 Firstly, the yarn is medicated before weaving and secondly, the fabric is dyed after weaving. The raw yarn is cleaned by a natural bleaching agent and dipped in Ayurvedic concoctions lasting from 4 hours to several days under controlled temperature. The encapsulation is assisted by a natural gum. 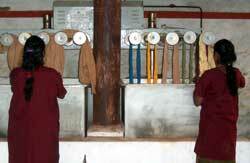 It is allowed to dry and then is washed carefully to remove any loose particles. The processing of Ayurvastra begins with the washing of hand loomed cloth in natural mineral-rich water and sea salts to remove its sizing, gums and oils used in the course of spinning. Fabrics are exposed to direct sunlight, then it is bleached with biodegradable, naturally derived, organic cleaning agents and surfactants like Saptala (Acacia Sinuata), Phenila (Sapindus Mukorossi) etc. To make the colours bright and fast a number of natural mordents such as bark of Lodhra (Symplocos racemosa), Kenduka (Diospyrose ebenum), fruit extracts of Haritaki (Terminalia chebula) etc are used. Alum clays, Iron clays are also used as mordent. But mordents like copper, chrome, zinc, tin etc are avoided due to the environmental reasons. The organic cotton yarn or fabric is then medicated in a carefully controlled mixture of herbal medicine preparations called Kashayas depending upon the disease or ailment being treated. The word medication is used instead of dyeing because here the medicines itself gives natural colour to fabrics. The temperature of the Kashayas, the duration and number of the medicinal soaks, the blend of herbs and the equipment are carefully used in a controlled manner. The medicated cloth is allowed to cool and repeatedly washed to remove any loose particles and is always dried in shades. In herbal dyeing, finishing is done by sprinkling pure water on the cloth and then stretching under pressure, using hand rolls, allovera, castor oil etc. The entire process is organic. It does not pollute the environment like synthetic dye. And the waste is used as bio manure and also to generate bio gas. The technology for making Ayurvastra is being utilised for making coir mats, mattresses, door mats, carpets and fabrics out of bamboo, jute and silk.